Today and Tonight: Mostly cloudy skies to start off your Friday, but clouds will be breaking through the morning hours. This will lead to sunny skies shortly after noon, but warming will be slow because of the lack of sunshine early. 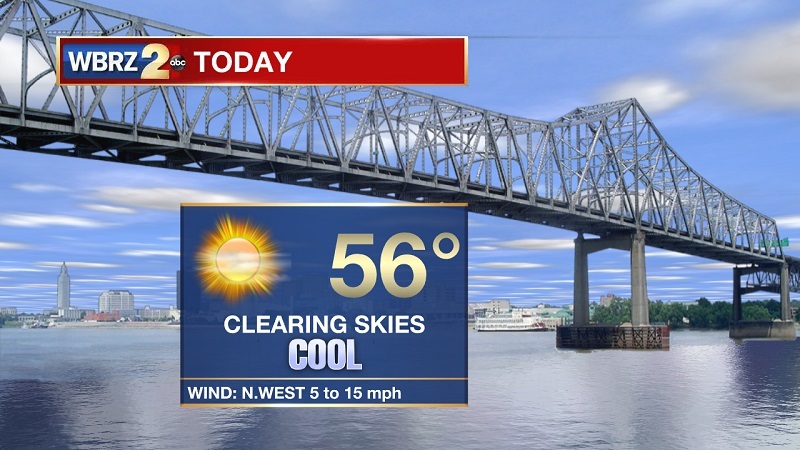 Temperatures will break into the 50s around noon, with highs reaching near 56°. Winds will also be rather breezy between 5 and 15 mph out of the northwest. Skies will stay clear tonight with calming winds, helping temperatures to plummet quickly into the 40s by 6 PM. Lows will be reaching around 37° overnight. Up Next: Sunny conditions through much of the weekend, but a weak system will bring areas of drizzle in the forecast Sunday and Monday. The next substantial blast of showers and storms will occur Wednesday into Thursday, with some strong to severe storms possible. The frontal system that has been keeping showers and clouds in the area is finally departing toward our east. This will help to break clouds up through the day today as high pressure approaches from the southwest. This high will move directly over Louisiana tonight, keeping clouds and winds to a minimum. Sunny skies will stay the course through much of the weekend, but clouds will slowly increase through Sunday as the high slides east, and a broken frontal system moves in. This system is rather weak, so just drizzle to light rain is expected Sunday into Monday. High temperatures will stay elevated in the upper 60s to low 70s through the holidays. Conditions should stay relatively dry through Christmas Eve and Christmas Day, but conditions will degrade quickly Wednesday and Thursday as a strong frontal system drives through. 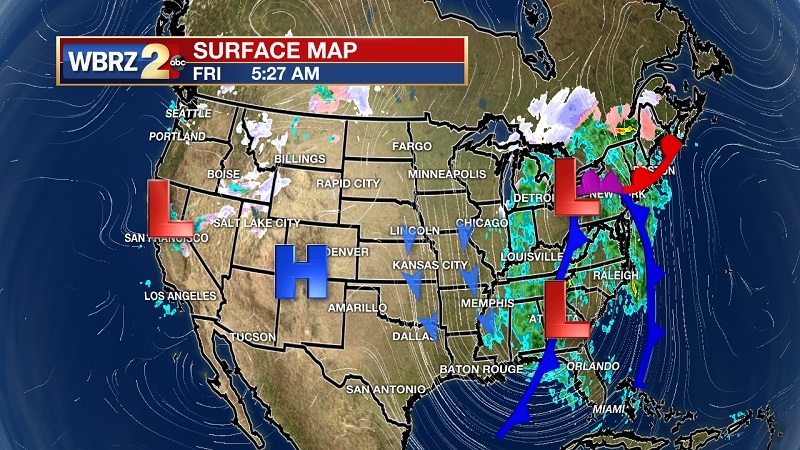 This front will pick a developing low pressure up from the Gulf, keeping rain rather widespread, and elevating the potential for strong to severe storms. Atmospheric dynamics will become more defined as we get closer, providing more confidence in the potential for instability and severe storms.